To Indians like me, the name “Tandoori Chicken” leaves us mouth-watering. It is one of the popular recipes from Indian cuisine which is made in clay oven called tandoor. Chicken (as a whole or drumstick pieces) is marinated in yogurt, lemon juice and other spices over-night and roasted in the tandoor to give this exquisite and scrumptious dish which can be served as appetizer or a heavy snack. You can make this recipe easily at home without the tandoor, in a oven or a grill. Alternatively, if you don’t have access to any of them, simply shallow fry it in a non-stick pan. I made this on Sunday for lunch and served with coriander and yogurt dip and it was a guilt free indulgence. I didn’t go over board on spices nor used any ready made tandoori masalas. I used extra virgin olive oil instead of butter and the result was much better than I expected. You can use vegetable/canola oil too. The important thing to do is to let the chicken marinate in yogurt for over-night, at-least 6 hours to make it tender and juicy. 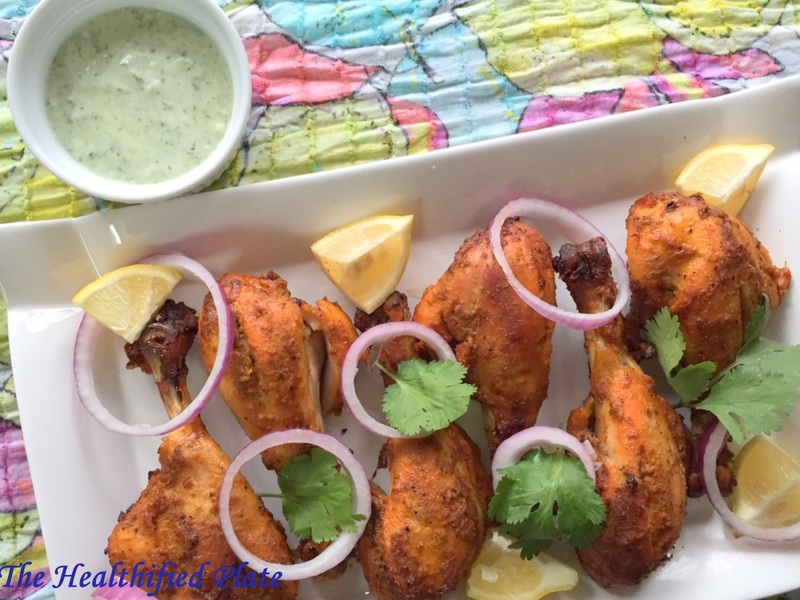 Enjoy this scrumptious, homemade and healthy tandoori chicken with nice mint or coriander dip. 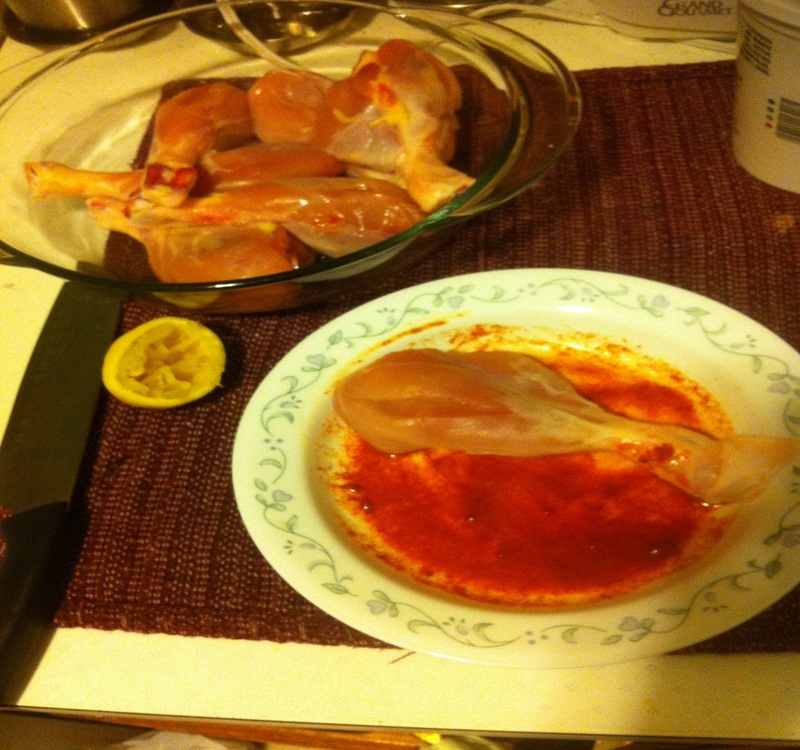 Wash the chicken drumsticks and make two or three 1″ slit on the thickest part of the flesh. 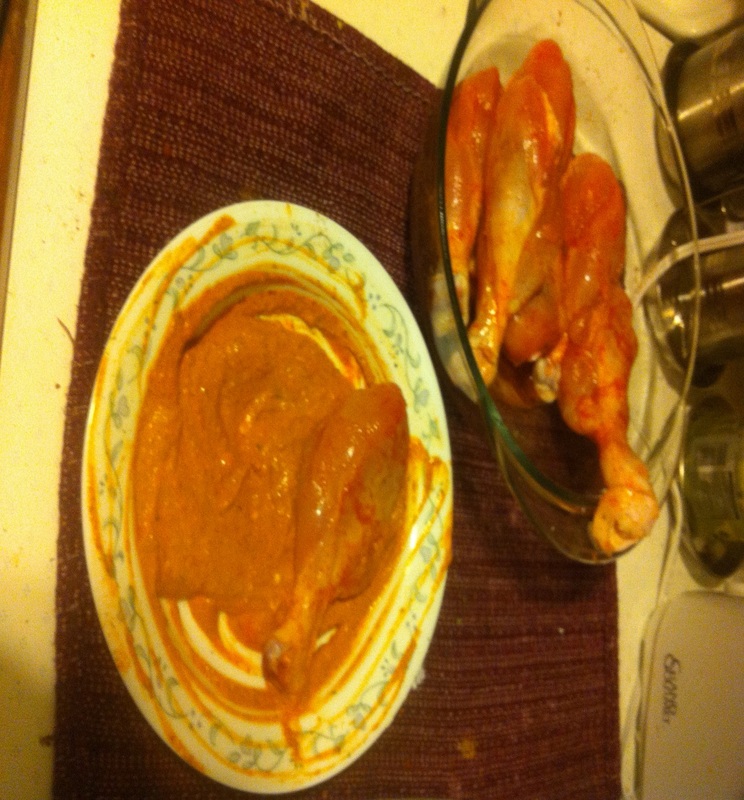 Mix the first marinade ingredients and rub into the pieces and set aside for 10 mins. 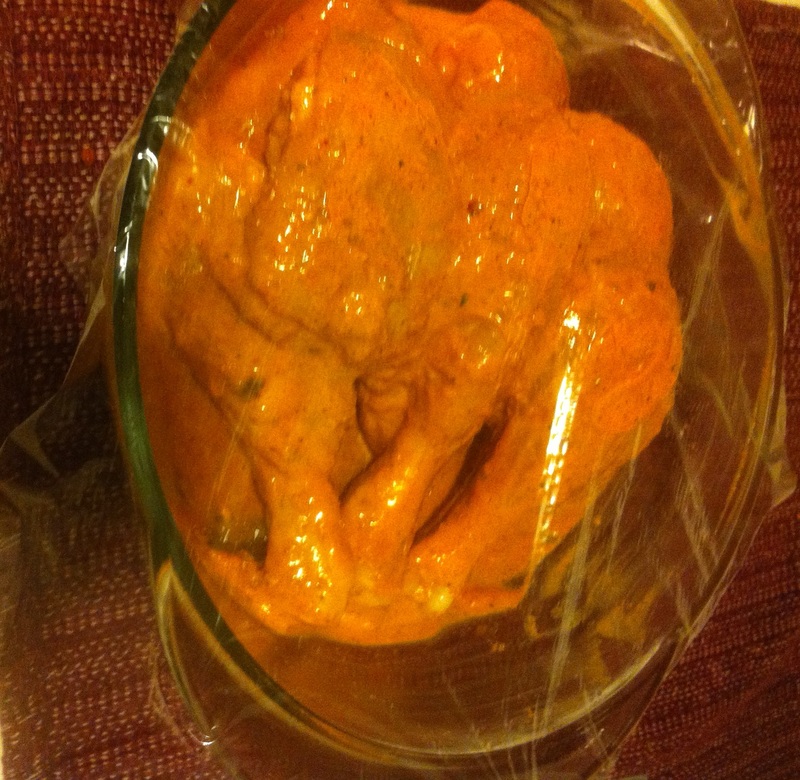 Mix the ingredients on second marinade list and massage it nicely on chicken and cover and refrigerate over-night. Preheat the oven to 425°F and line a baking sheet with foil and make small holes in the foil to let the water released during cooking process escape. Place the chicken drumsticks in middle rack and bake for 35-40 minutes turning sides for every 15 mins. 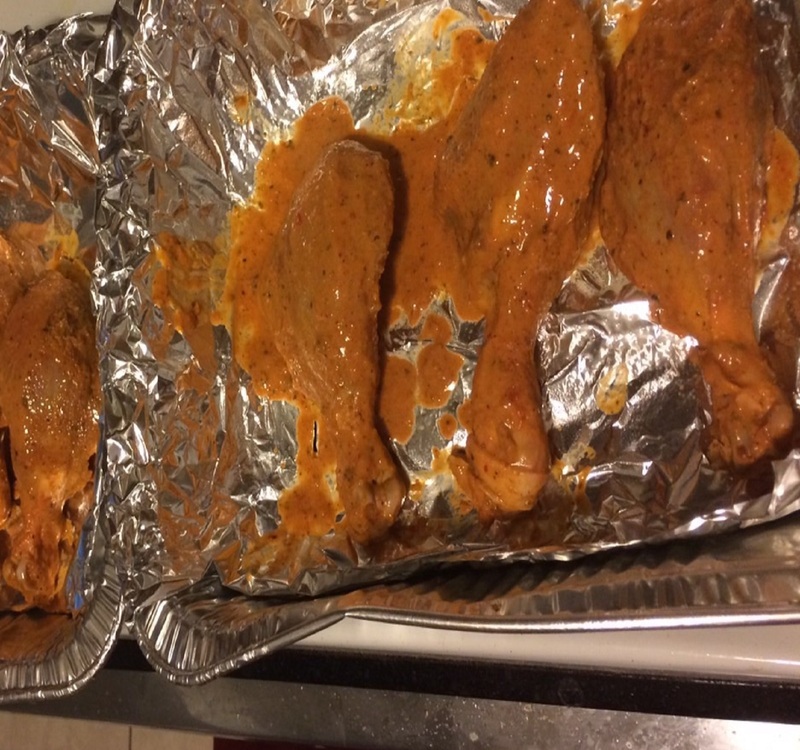 Occasionally brush with the remaining marinate if the surface seem very dry or spray with non-stick cooking spray. Broil for 2-3 mins on high on each side for that grilled look. If you choose to shallow fry it, add 2 tbsp of cornflour just before frying. Make an easy coriander dip by grinding coriander leaves, yogurt, green chili, salt and lemon juice till desired consistency is reached.